"Pippa Marland has a real autumn leaf of a voice, ('My Crescent City' is) a really great album - wonderfully moody and emotional"
Hauntingly exploring loss and the fear of loss"
"This is an impressive album...a fine mixture of traditional and original material, with a few well-selected covers. "The music of Carmina..her voice, beautiful melody, musicianship.. I am sure many people in Japan (will) appreciate their music"
"Pippa Marland, one of the best trad folk singers at this year’s Stainsby festival"
"They left the rest of the bill playing catch-up for the rest of the afternoon"
Hi Pippa, Rob & Geoff..
Just thought I'd drop you a note to say how uplifted I feel after yet another superb Carmina gig at the Ram. When you first approached us for a gig a few years ago, we weren't sure what to expect, but you were a revelation! The fact that you filled the place yet again and got your usual ovation at the end is testament to the fact that you are a big favourite of our regulars. What mystifies me is how so many folk clubs, and also festivals, have failed to cotton on to you. Perhaps they think Folk and Jazz shouldn't mix? Well, if they take the trouble to listen to you they will see that it does! At the Ram we don't hear 'Celtic Folk with elements of jazz' - just the holistic whole, and it is wonderful! As ever, your playing was inspired, flowing, melodic, celestial, and the songs have light and soul by the bucketful. Pete was a genius and we miss him, but his presence is still felt and Geoff has blended in seamlessly with his own style and is rapidly making his mark. The new batch of songs is sounding great too. As a seasoned festival-goer, my idea of bliss would be listening to you lot (especially the expanded version) on a warm summer afternoon at a Trowbridge, Larmer Tree, Cambridge or Cropredy with a beer in my hand. As a big fan of Van Morrison, Paul Brady, Eddie Reader and Mary Black I can't understand how you've slipped through the festival net, so please get on the case for all our sakes! Sorry to Ram-ble on, but I've started so I'll finish by saying that if I were dumped on a desert island for my sins, with only an eight-shot iPod, at least two of the tracks on it would be Carmina songs, namely 'The Leaving Wakes' and 'Carolan'. Looking forward as always to your next visit. It's an unlikely combination, easy on paper, difficult in execution but last night at Live On The Park in London, Carmina brought its synthesis of road hardened jazz and folk to the metropolis with considerable aplomb and sophistication. Singer and saxophonist Pippa Marland and guitarist Rob King are the driving force behind the band that has developed a grassroots following over a decade. 'Bird of Paradise', and best of all 'Carolan' slipped down nicely in the first set decorated prettily by Geoff Castle casting his spell of Celtic silvery calm on piano and keys. The highlight overall was 'Lord Franklin', recorded by Carmina for the album On a Quiet Street: Live In Ireland. The second set was strengthened by 'Concorde' co-written by the pair, but King's bodhran playing also impressed even if it was overshadowed by his Fiachra Trench-style arranging. The band would probably sound a treat with a small string section or a solo violin player. There was some improvising, but it was carefully controlled. The caution, though, did not allow the music to fall between the gaps, often a bit of a worry when the chips are down on this sort of gig. Marland's voice has an Enya-like floaty ambience about it, well capable of navigating the shifting seas between jazz, new age and folk flavours. Subtly different than what Lammas used to produce, less sombre perhaps, but also a world away from the Celtic rock heroes of yore, Horslips. Carmina are worth catching live at the Marlborough Jazz Festival on Saturday. "Unfortunately there aren't enougth (folk) organizers openminded enougth to include the jazz-inflected Celtic music of Carmina in their program. In 2002 Carmina's piano player Pete Jacobsen died. It was almost impossible to replace such a gifted musician. We remembered him during a fine solo piano piece by Geoff Castle in "Weather in the Heart". Every concert by Carmina sounds different, that's because Carmina is a collective and operates in different formats, but always with core members Pippa Marland and Rob King. Especially for the Fidder Folkfestival Carmina was extended with Brian Morrissey, who's fantastic banjo playing (e.g. in "Lord Franklin") gave the beautiful sound of Carmina an extra boost"
"Brilliant Musicanship. Hailed by Jazz and Celtic aficionados alike for their music inspired by both traditions - One of the highlights of the festival"
"Mesmerising...bewitching...Carmina's songs are effortless in the international language of love and the emotions"
"There is no more effective aural anti-depressant"
"The deliciously catchy single, Red River Valley Girl, has been wafting out over our airwaves for a couple of months now, providing the perfect aural backdrop to the recent summer heatwave. Singer Pippa Bagguley possesses a singularly appealing, honey-smooth voice, blending the fragile tones of Tori Amos with the undeniable influence of Joni Mitchell's vocal phrasing. And while Carmina's Donal Lunny-produced debut Weather in the Heart is not entirely in that melodic vein, they nevertheless concoct a resonant, jazz-pop sound that floats along like a tropical breeze. The title track, with its bossa-nova rhythms and brilliant saxophone solo - courtesy of sometime Van Morrison side-man Richie Buckley - best illustrates Carmina's strengths as a combo with no little musical assuredness. The group's more introspective side is revealed on haunting atmospheric ballads like Bird of Paradise and The Five Lakes, while Donal Lunny's influence is apparent on the Planxty-like Down to Land/Garret Barry's. What's more, The Leaving Wakes, a poignant tale of 1920's emigration, demonstrates Bagguley's ability to tackle more traditional material in the Dolores Keane vein. Piano player Pete Jacobsen reigns supreme on a version of Micheal O'Suilleabhain's Ah, Sweet Dancer, and also provides the instrumental highlights on the album's epic closing number Mountains of Prayer a soaring, eight-minute ballad which fittingly captures Carmina's multi-layered approach. Weather in the Heart is a brilliant debut from an outfit we'll be hearing more from in the near future. Count on it"
"Carmina purvey a rootsy and jazz-inflected music of pastoral beauty, elegance and style. Lead singer and saxophonist Pippa Marland is possessed of a wondrous voice capable of enchanting and emoting. The excellent album, Weather in the Heart, is recommended"
"Founded by Pippa Marland and Guitarist Rob King, Carmina includes some world-class musicians and has already won popular acclaim with their debut album Weather in the Heart. The band's eclectic mix is hauntingly beautiful, while rhythmical songs like 'Weather in the Heart' and 'Down to Land' will get your feet tapping. The band lists many Celtic landmarks as inspiration for their songs, including even the blast furnaces of Port Talbot! Next Thursday's Christmas concert will certainly warm your sprits, so book your seat, sit back and prepare to be whisked away from London's grimy streets to a green and pleasant land"
"Fusion as a term is usually applied to a jazz-rock mix, but it accurately describes any merging of two distinct musics, in this case Irish Folk and Jazz. This fusion works particularly well, not least because it builds on the solid structure of a folk duo - the leaders Pippa Marland and Rob King - augmented by Irish folk musicians and supported by the classic jazz quartet of piano, saxophones, bass, and drums. Textures and timbres from the different disciplines complement each other, and Marland's crystal clear vocals and the soft, lilting saxophone and piano solos carry all before them. 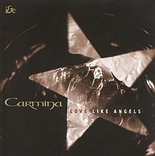 Good on record, I suspect Carmina would be even better live"
"For my money I'd rate it [Red River Valley Girl] as one of the finest Irish singles this year. Their Everything But The Girl meets Swing Out Sister sound is seriously subtle and incredibly melodic...believe me, I could rave on and on about this excellent 'find' for the Irish Music biz - their potential, I imagine, is nothing short of extraordinary"
"Tracks like Carolan, Bird of Paradise, Mountains of Prayer leap out, as does Pete Jacobsen's sensitive interpretation of Micheal O Suilleabhain's Ah, Sweet Dancer - Sheer class!" "Every once in a while there comes a man [ref. to Rob King] with a musical vision, a sound so inspirational and new, that it cries out to be heard. 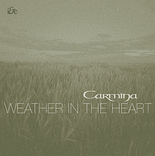 Carmina, who have been described as 'one of the hottest collections of musicians to appear in any Irish-based band in aeons', have now won back the rights to their stunning debut album 'Weather in the Heart', which was produced by Donal Lunny, that well-known guru of Irish traditional and progressive music. And that is what you might call Carmina's sound - progressive. 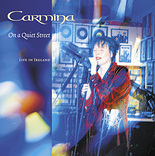 Using a rare blend of folk and jazz, Carmina takes the listener on a veritable voyage of sound, courtesy of Pippa Bagguley, whose voice is utterly angelic and soothing to the soul"
Special mention should be made of the magical and majestic contribution made by Pete Jacobsen on keyboards, and of Nigel Thomas' ever-swinging double bass playing. Buy it, play it and then try to live without it"
"This collection of evocative songs takes the listener on a lightly jazz-tinged journey through Celtic land and timescapes. Pippa Marland and Rob King draw the songs broadly touching the past as often as the present, and can weld the two together seamlessly as in Carolan. Weather in the Heart draws a parallel between the emotions and chaos theory (the butterfly's wing and the storm!) The instrumental settings reflect the imagery and there are some lushly mellow moments from keyboards, saxophone and pipes"
Concert at Trinity Theatre, Tunbridge Wells. "Pippa Marland's beautiful voice recalls pop/folk icons over the years from Judy Collins to Eddie Reader, the group sound has been likened to Swing Out Sister and even Van Morrison. Stir in a solid helping of shimmering jazz piano, a little synth wizardry for that special orchestral touch, some crunchy bite-size bars of free-wheeling saxophone, and the saliva inducing rhythms of market places from Dublin to Sao Paulo, and you're getting the taste. Add brilliantly crafted songs telling sad and joyful stories of universal appeal, and you have the stunning music of Carmina"
"Carmina's recording, Weather in the Heart - described by national music magazines as "very possibly a masterpiece" and "a five-star album that is utterly indispensable" with a sound that recalls Van Morrison, Eddie Reader and Moving Hearts, they combine virtuoso musicianship and exotic rhythms with heartfelt lyrics telling sad and joyful stories of universal appeal. "Such wonderful, heartfelt celtic music!" "Excellent single, brilliantly produced and shows Pippa's voice off beautifully. I'll be playing this and other tracks until the rest of the world wakes up and finds out what it's missing. Justice? I just hope it comes quicker for you than Mandela". "A remarkable debut from an outfit we'll be hearing more from in the future - count on it"
"Pete Jacobsen's touch on the keyboards is heartfelt in delivery, the wonder is that the rest of the band don't just stop to relish such inspired musicianship!" "Carmina's first public performance in Spain can be considered as one of the best ones of this year in Madrid, creating a really warm, special atmosphere, the way only the best bands do, right from the beginning.. in summary a recipe for success"
"The lyrics of their songs are intelligent and the acoustic instruments make for a really beautiful sound. "The sound can vary from spare and soulful ballads to lush soundscapes and dazzling jigs, both traditional and homegrown, this is an original and powerful band that deserves success, airplay, major festival slots, good to have them back in town"
"Carmina is the freshest, most original band to appear for a long time, anywhere"
'I went to see Carmina in 'De Fagot', folkcafe in Ingelmunster, West-Vlaanderen. A wonderful concert! For me a real revelation late in the year. Pippa gave me goose-pimples from the beginning with her wonderful voice. There was even a surprise act with Micha Marah and Peter Derudder (uilleann pipes). One hell of a gig! The band had the audience eating out of their hands, and Pippa herself said it was the nicest and best gig of their tour. Great interplay between Pippa, Rob and Pete Jacobsen (keyboards). I was standing at the bar about to order a little light refreshment when suddenly there was darkness - a power cut just before the club opened didn't bode well for Carmina whose staple ingredient is Pete Jacobsen on electric keyboards. Pete didn't seem too bothered and took it as an ideal opportunity to imbibe more beer at the bar. The night began with a longer than usual session of floor singers of varying quality - all acoustic and unhindered by microphones or electric light - a lone torch beam illuminated the fretboards and flickering candles allowed us to see the singers, just. Carmina decided to take the stage as a duo with Pippa Marland on vocals and sax/whistles and Rob King on guitar. Without amplification Pippa's ethereal vocals did get a little lost but towards the end of their fourth song there was, suddenly, light - Just in time for the break!. Pete, pockets bulging with bottles of lager, was led to the stage and the Carmina trio began their set with a Jacobsen solo piece - to get their own back!. Carmina at larger shows are a six piece band playing Celtic, Jazz and Rock influenced songs - the latter, without percussion, was not in evidence tonight but Pete's jazz influence was. Again the enthusiastic Ram club audience joined in but a little unsurely this time due to the originality of some of the material.